AltRider: The AltRider Story - Thanks for a great party! We would like to thank everyone who joined us for the AltRider Sneak Preview party at Smarty Pants on September 9th. We’re glad you were there to meet the AltRider team and celebrate the start of AltRider with us. We had a great turn out, completely filling up the outside patio, and even spilling into the main bar, mixing up with the Smarty Pants “Bike Night” crowd. Our coffee table book with designs, sketches and prototypes of future AltRider products made the rounds, as guests enjoyed spirited conversations with new and old friends. The spreads of Smarty Pants’ famous sandwich sliders were a big hit, on par only with the complimentary drink tickets and attentive smiles from our resident umbrella girls. 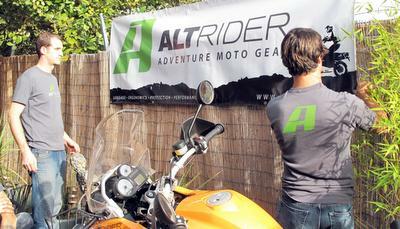 Congratulations to the three raffle winners who took home the very first limited edition AltRider t-shirts! We have a lot of work ahead of us, as we prepare to launch the AltRider line of products and our website. Stay tuned for more news and updates, and join us at upcoming AltRider events.